The World Series of Poker heard the voice of the players and included a six-handed PLO event on this year’s schedule. Event #35 $5,000 Pot-Limit Omaha/Six Handed was the first of its kind and appealed to an assorted mix of amateurs, professionals, and seasoned online players. When registration closed two days ago, 507 players had entered to create a prize pool of $2,382,900, with $619,575 of that reserved for first. It took three grueling days of intense play, but eventually it was Jason Mercier who defeated a stacked field to claim the prize and his second PLO WSOP gold bracelet. The flop came down and Jetten open-shoved all in, Mercier instantly went all in, and Devilfish called off his stack. Ulliott was ahead with a set of jacks, but Mercier had both straight and flush draws and Jetten's aces weren't looking too good. The turn came to give Mercier the straight, leaving Devilfish looking to pair the board; however, the river was the and both Jetten and Devilfish hit the rail. Of course the ever-vocal Devilfish didn’t leave before calling Mercier "the luckiest f***ing mother f***cker alive"
Brooks’ elimination meant the official final table had been reached. It was there that WSOP rookie Michael "Timex" McDonald got his short-stack all in against four-time bracelet winner David Chiu. Unfortunately the board ran out and Timex was eliminated in sixth place for $73,965. The next elimination came some time later and in excruciating fashion. It began when Joe Ressler raised to 80,000 from under the gun and the action folded to Steven Merrifield in the small blind. He called as did Mercier in the big blind to see the flop fall . Merrifield and Mercier checked to Ressler who bet 150,000, only to see Merrifield check-raise to 425,000. Mercier folded, Ressler snap-shoved and Merrifield insta-called. It was set-over-set as the dealer burned and turned the . Ressler was one card away from a double, but much to the shock of his supporters, the spiked on the river. Merrifield had hit a one outer to send Ressler home in fifth place ($105,967). The next to go was Chiu, who grew extremely short stacked and couldn’t outflop Mercier. The four-time bracelet winner hit the rail in fourth place, worth $156,628. Three-handed play began with the chips essentially spread equally between the players. Merrifield held a small lead, but short-handed play did not go his way. He was chipped down considerably and eventually eliminated at the hands of Hans Winzeler. That left Mercier (3.49 million) to do heads-up battle against Winzeler (4.125 million). The heads-up match saw the chip lead change hands a couple of times, lasting almost two hours. In the end, Mercier hit a straight on the river to claim the title, his second in the PLO variation, with his previous victory coming back in the 2009 Event #5 $1,500 PLO after he cleared a field of 809 players to claim the $237,462 first-place prize. That means he has now won two PLO bracelets for a combined $857,037. Congratulations to Jason Mercier on becoming the Event #35 $5,000 Pot-Limit Omaha/Six Handed champion. That does it for our coverage from this event, but there are plenty more ahead. 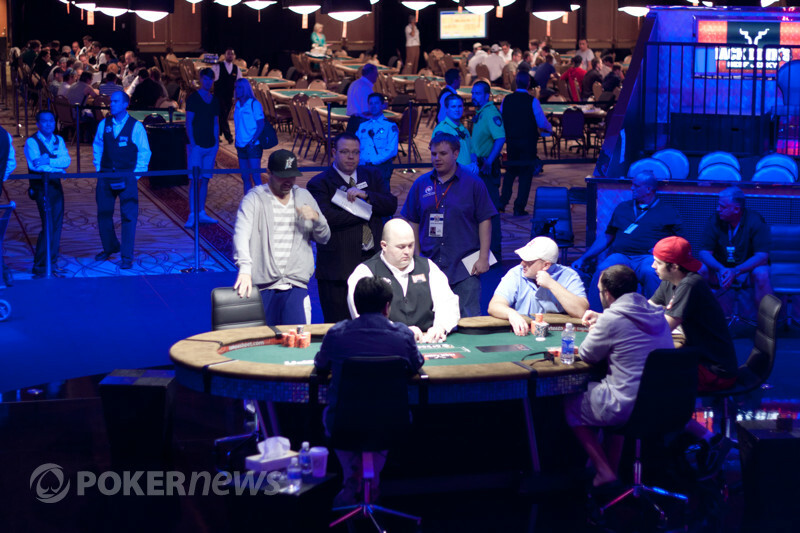 Be sure to stay tuned to PokerNews for all the updates from the 2011 WSOP. 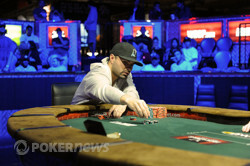 Hans Winzeler Eliminated in 2nd Place ($383,075); Jason Mercier Wins! It almost seemed like we were in for a long night, but Jason Mercier has just defeated Hans Winzeler heads-up in stunning fashion to claim his second WSOP bracelet! Earlier, Winzeler raised to 160,000 before the flop from the button and Mercier called before both players checked the flop of . Mercier then led out for 165,000 on the turn of the and Winzeler called before Mercier bet 390,000 on the river of the . Winzeler folded his hand. Down to less than 2.8 million, the final hand of the night came after two sets of blinds were passed between them. Mercier raised to 160,000 from the button, only to see Winzeler re-raise to 480,000. Mercier called and then the dealer spread the flop of . Mercier bet 960,000, Winzeler potted all-in and Mercier snap-called. Winzeler was in front with the overpair, and he kept the lead when the came down on the turn. Needing any deuce, trey, five, six or seven, the audience went bananas when the spiked on the river and Mercier's supporters jumped the rail in droves to kick off the celebrations! It was a truly impressive display from Winzeler, who held his own against 505 other superstars in what can only be considered the greatest field ever assembled in modern WSOP history. Unfortunately, he was pipped at the post, but there is no shame in taking second place tonight (and of course, there's 383,075 reasons for him to smile). We're sure that we'll see him back even more determined to snare gold. 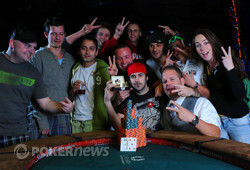 But to the victor go the spoils - ladies and gentlemen, we present to you Jason Mercier, the 2011 WSOP Event #35 champion! Hans Winzeler raised to 160,000 on the button only to have Jason Mercier make it 480,000 to go from the big blind. Winzeler made the call and there was nearly a million in the pot preflop. Just when it seemed like there might be some fireworks, both players checked the flop, as well as the turn. When the hit the river, Mercier decided it was time to put out a bet, settling on 530,000. Winzeler didn't take long to make the call, but ended up mucking when Mercier turned over for a straight. Hans Winzeler may not be familiar to most poker fans, but the Florida professional is no stranger to poker. 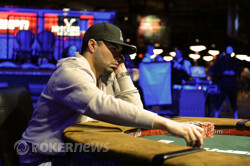 Not including today, he has amassed five World Series of Poker cashes totaling $40,921. Whether he wins or takes second, Winzeler is destined to get his biggest cash to date, which will be close to, or more than, 10X his total lifetime earnings. Not a bad day for Winzeler. The cards are back in the air! Two more levels until we either crown a champion or bag and tag, whichever comes first. The two remaining players are now on their last 20-minute break of the evening. Steven Merrifield, Jason Mercier, Joseph Ressler, and David Chiu begin play while Hans Winzeler is still on break.